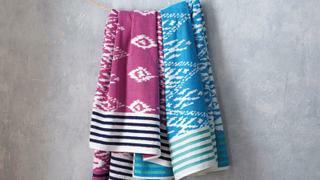 John Robshaw, best known for his ebullient Indian textiles, riffs on a traditional Thai ikat for his Dita Lotus beach towel. The designer has played with scale, colour and orientation to refresh and update the classic pattern and frames the graphic design with horizontal stripes. Today’s tennis gear is generally a far cry from the formality of yesteryear’s all-white dress code. To restore a little vintage charm to the game, Parker Thatch has introduced a cotton canvas racket carrier. 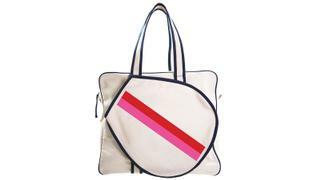 Roomy enough for two rackets, it can be monogrammed and comes with bold racing stripes. 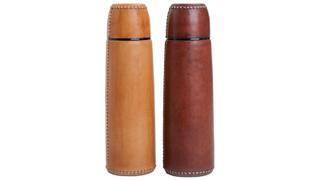 Sol y Luna is known for its tailored leather-sheathed accessories. Using wood and leather from the Chaco region of Argentina and Paraguay, the artisans offer on- the-go goods, from thermoses (pictured) to coolers, gardening tools and picnic cases, along with furniture. San Francisco-based textile store St Frank has garnered a reputation for sourcing indigenous textiles like shibori and kuba cloth and elegantly framing them in Lucite boxes. 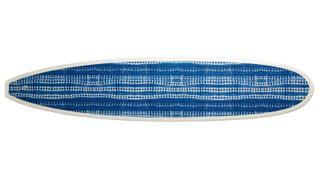 Partnering with surfer and fine surfboard maker Gary Linden, St Frank has released a collection of surfboards in kuba cloth, West African indigo and mud cloth patterns. 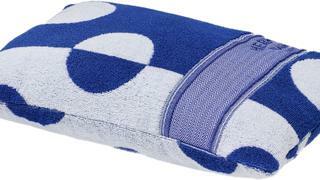 Hermès’ all-cotton terry cloth Yachting Dots beach pillow has a playful Art Deco polka dot pattern. The durable cushion provides ideal rest between waterborne adventures and comes in two vibrant colourways.